Rio would mark our half way point in our travels around the globe and as such we booked a nice four star hotel close to the beach for a bit of luxury. We landed at the international airport and because of the time difference it was already evening by the time we were in a taxi to the hotel. We saw the briefest of glances at the Christ the Redeemer glowing on the hill above us but that was about it. Our hotel was nice, compact but nice and in a good location. We had some drinks at the bar that evening and an early night. The next few days consisted of some of our laziest all travels. Lazing by the pool; sitting on and walks along Ipanema beach; drinks and dinner in the evening- nothing to write about but relaxation. On the Friday we booked a tour to see the sites of Rio. 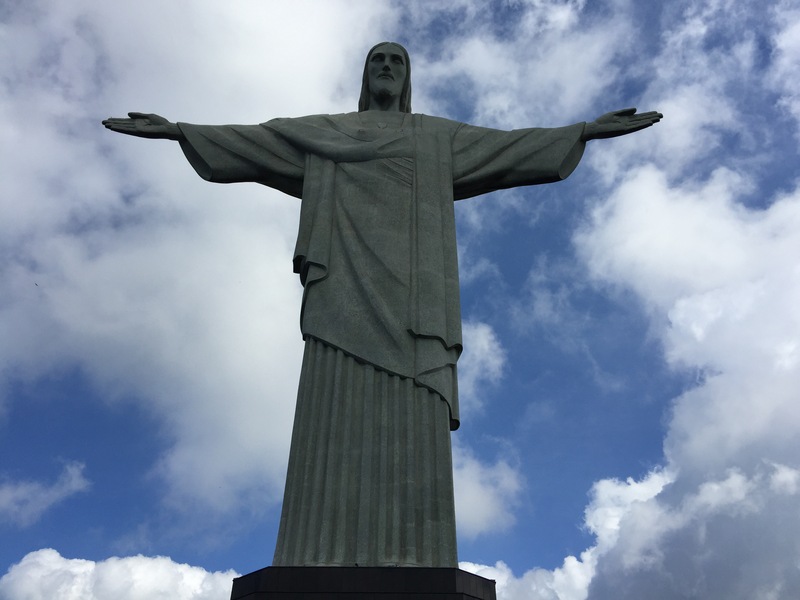 We were picked up early in a van and after picking up some other tourists from other hotels, we were on our way up Mount Corcovado the home of Christ the Redeemer. At over 700m it is quite a steep climb and we stopped half way for a view of the favelas below. Once we reached the ticket station, we had to change buses onto the official park bus up to the top. We climbed the steps and saw some Capuchin monkeys on our way as well as stunning views of the city below. Once at the top it was crowded with everyone in front of the statue trying to get their selfie with their arms out imitating the statue. Standing at over 70m he was imposing but somehow I thought he would be bigger. We posed for photos and our guide helped us to take one that made us look like we were holding his hands. The real photo however though was from the end of the platform of the city below. You could see the Maracanã stadium, Sugarloaf Mountain, Copacabana beach, Ipanema beach and many other sites to name a few. We descended the platform taking our last few photos and headed back down the mountain to our van passed more monkeys. We drove back down through the narrow streets passed a quaint yellow tram and onto the metropolitan cathedral. It was a modern building in the shape of a giant pyramid like dome or volcano all grey. You could enter from 4 sides through huge doors and once inside you were greeted with enormous stain glass windows, that went all the way to the roof where the sunlight formed a cross. The inside was cavernous and filled with hundreds of pews and a large alter at the centre. The cathedral was also very busy as an armed services service had just finished. There were several hundred Brazilian army, navy, marines, and airforce all wondering around waiting for their transport back to base. 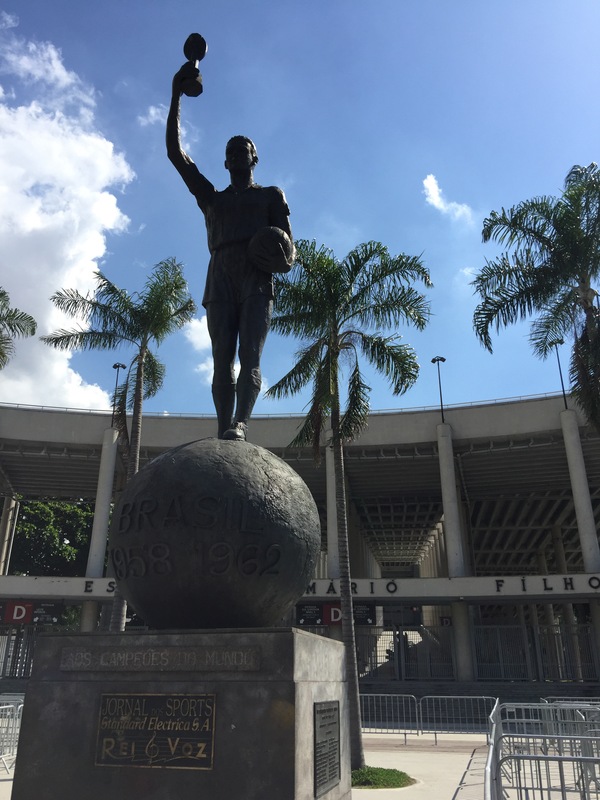 Next stop was the Maracanã stadium. A brief stop outside as we couldn’t in. However there was a statue of Hilderaldo Bellini (the Brazilian football captain) lifting the the 1958 World Cup trophy, that Mike posed for a photo in front of with a fake trophy. Afterwards we stopped at the carnival street where the famous yearly carnival passes through and we viewed some of the costumes. It was a strange stadium in a straight line that is basically only used once a year. After a free buffet lunch we continued our tour to Sugarloaf Mountain. Called Sugarloaf as it looked like the piles of sugar the Portuguese were shipping back to Portugal in the 16th century. First we took the cable car up to the first mountain Morro da Urca at 220m. We would stop here on the way so we continued through onto the second cable car. Here we ascended to 390m to Sugarloaf. The old car cable was famous as a scene from the film Moonraker with James Bond when Jaws tries to bite the cable car wire. Once on top we walked around taking panoramic pictures of the city below us and enjoying the view. Mike wasn’t keen on the height so he didn’t like standing on the edge or enjoy the cable car rides! Once we walked around for 40 minutes we descended to Morro da Urca and took more pictures. Here our guide helped with pictures of us looking like we were picking up cable cars and holding Sugarloaf mountain. 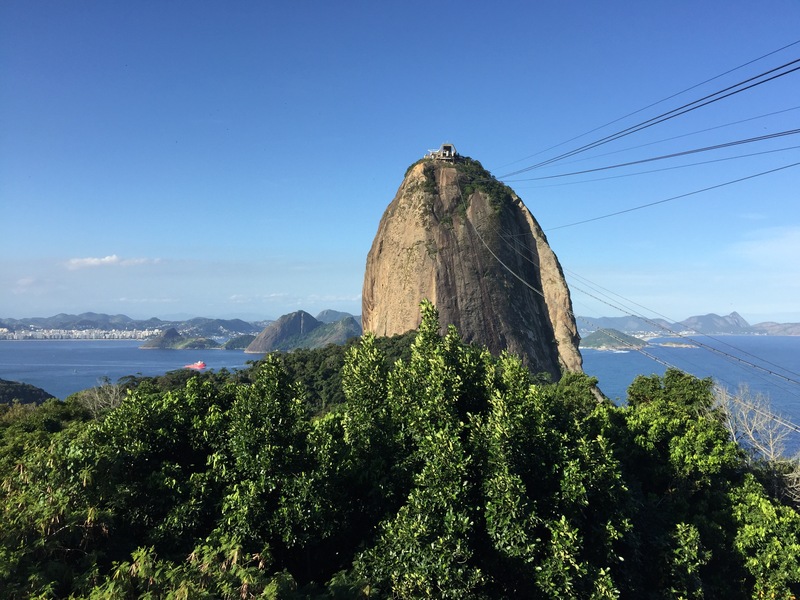 From here we could also see crazy climbers free climbing the side of Sugarloaf Mountain! Quite a dangerous site! After some more pictures we again descended to ground level. We ended our tour with a stop on Ipanema at sunset and we walked back to our hotel. A great tour to get out and see the city. 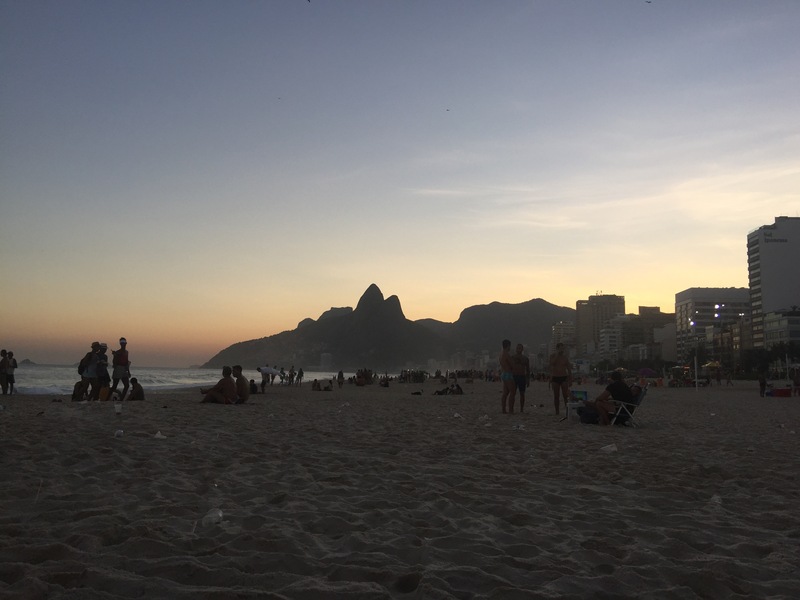 The following day we had another beach day first at Copacabana and then in the afternoon on Ipanema. Here we drunk the local cocktail caipirnha. They were probably the strongest cocktails we had ever had,so much so that after 4 each we couldn’t remember getting back to the hotel. I apparently also thought it was a good idea to throw my sunglasses into the sea! The following day was spent in bed recovering with a massive hangover. We also brought back half the beach as the amount of sand in the room was ridiculous! And so our week in Rio came to end. It fulfilled our expectations of a relaxing stay and recharged our batteries ready for exploring South America for 2 months!